Voices of Transition is an inspirational look at problems and solutions to the food security challenges we face as a society. 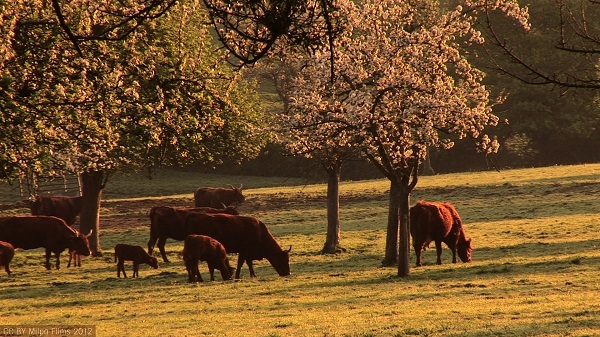 A perspective into a movement from three different angles: agroforestry models in France combining orchards with diverse agricultural fields; permaculture and transition town community initiatives in England; and the abrupt, but necessary, organic farming revolution in Cuba. How can we feed ourselves in the future? What alternatives are there to industrial agriculture? How can we make the transition to a re-localized, truly resilient economic system? Voices of Transition poses these questions – and presents inspirational answers. Also touching on generational differences between farmers, the film looks into the efforts of a young French farmer, Oswaldo Forey, in his attempt to take the family farm organic. Interview snippets from Vandana Shiva and Rob Hopkins lend perspective and authority to the many social and environmental topics. One of the most compelling stories is the study on Cuba. Like most of the world, Cuba was once heavily dependent on oil for its agricultural production. Then, in 1991, the collapse of the Soviet Union meant the country was suddenly faced with a premature peak oil crisis. But this apparently desperate situation has grown into something truly inspirational. The Caribbean island has become a pioneer of agroecology and urban farming. 70% of all of the fruits and vegetables eaten in Havana are now produced right inside the city – and they’re totally organic. I found it to be a great primer on how several individuals and communities around the world are addressing the concerns over agriculture, farming practices, and community. In the ever-increasing globalization of agriculture and takeover by multi-national giants, the grass-roots resistance to factory-farms is a ray of hope. The more eccentric, yet passionate and enlightened characters are entertaining and insightful, and balance well with the scientific and intellectual arguments. 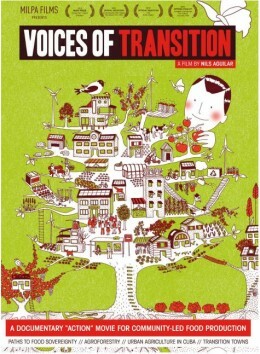 Voices of Transition (65 minutes, France/Germany 2012), directed by German-French filmmaker Nils Aguilar, explores exciting examples of socio-ecological change in France, England and Cuba.